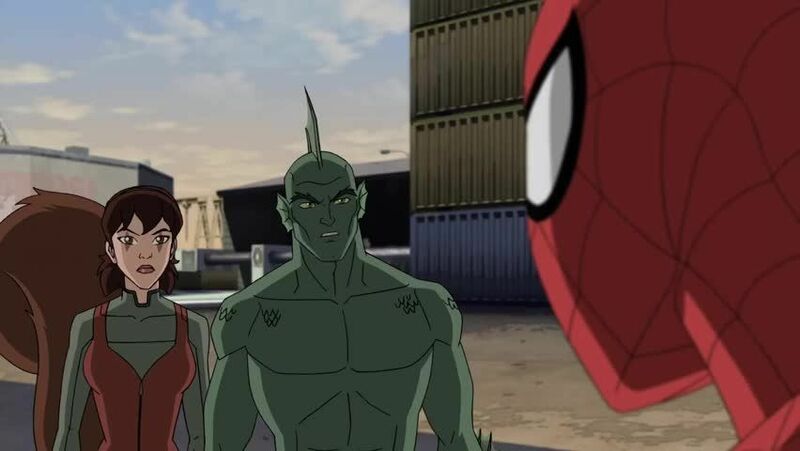 Watch full Ultimate Spider-Man Season 4 Episode 25 full HD online. Cartoon video Ultimate Spider-Man Episode 103 online for free in HD. As Peter Parker prepares to graduate from S.H.I.E.L.D. Academy, he is visited by Doctor Octopus who threatens to harm Aunt May if he puts on the Spider-Man costume again. Spider-Man refuses to agree and puts Aunt May in protective S.H.I.E.L.D. custody. After rounding up Scorpion, Kraven the Hunter, Vulture, and Rhino as well as turning Crossbones into a Lizard, Doctor Octopus allows himself to be incarcerated in the Triskelion’s security brig. The graduation ceremony attended by the Avengers, Doctor Strange, Sandman, Nick Fury, Power Man’s parents, Patrioteer, and Ant-Man. As he ends up breaking out while Spider-Man brings Aunt May to the graduation, Doctor Octopus and his new Sinister Six break free as he ensnares Aunt May. Spider-Man reluctanly injects himself with a serum to cure him of his powers in order to keep Aunt May safe. Doctor Octopus then takes control of the Triskelion where he places a contracting forcefield around the graduation ceremony.